Built a greenhouse (of a kind) after all these years of indecision on the matter. Since we are on a cliff by the sea and the wind can be ferocious, we decided on a well insulated cedar shed that doubles as a greenhouse. The plan is to build a large sunken cold frame up against the front of it. This should be all we need for winter gardening and starting plants in the spring. I’m completely in love with my new combined greenhouse and potting shed. It’s roomy in there, enough room for a plant table, a potting bench, a wall of shelves, and two chairs. It makes a nice little hide-away too. The view from the hillside garden. There was been no sun for the entire month of June and temperatures never rose above the 60s during the day and much colder at night. The June weather was like April with no sunny days. July is like May with a few sunny nice days in the 70s and still too much rain. The garden is doing surprisingly well considering the bizarre weather. We are currently feasting on an abundance of cucumbers, raspberries, parsley, garlic, basil, onions, mache, lettuces, purslane, dandelion leaves, nasturtium flowers, strawberries, radishes, beets, chicory, chives, and more. The rhubarb was ridiculously productive this year and is now finished up. Tomatoes, squash, and hot peppers coming up soon! We may or may not get figs and blueberries this year. It’s too soon to tell. The beans look less than promising. Avocados, lemons, and limes are the only produce I have purchased in the last four months. This entry was posted in In The Garden and tagged garden, magic by Aria Nadii. Bookmark the permalink. I was about to write to ask you if you wanted some hens and chicks. I’m overflowing with them. Looks great. Looks peaceful. I hope it’s both. Thank you. I am also overflowing with them though. Prolific little devils. It used to be peaceful here. Oh well. I’ll adapt. I’ll just have to be inventive. I’m good at it. We may be in similar ebb/tide flows. It looks peaceful here, but there’s an undercurrent of stress and something I can’t quite name that seems to threaten everything, or at the very least, put me very much on edge all the time. Sounds similar. Very. There is something weird like that going on here. I’m not happy about it but I am okay. I’ll adapt. I am definitely stressed. It’s a rainy slow week. We should have a chat. You have stories. I have stories. Maybe tomorrow or Thursday if you are free. Let me know. I’m at work right now. okay. I’ll make time tomorrow or Thursday. I’m free either. 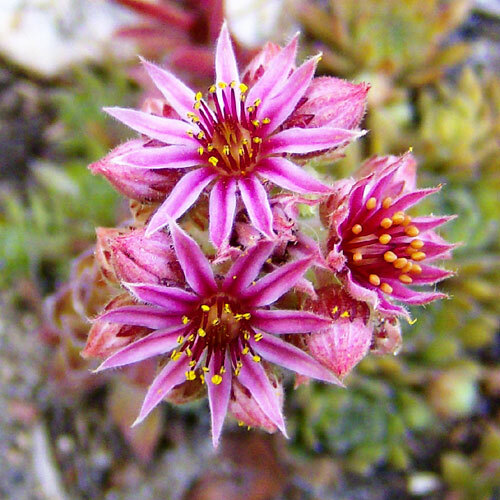 I don’t think I’ve ever seen flowers like that on Hens & Chicks (here in the south, they are called Hens & Bitties which amuses me). 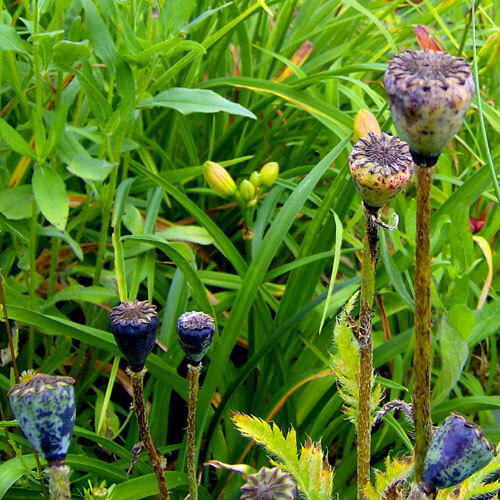 Your garden is word-defyingly gorgeous. Love the shed; bet it weathers beautifully. This is only the second year that they have flowered and I’ve had them since I was 12 years old. My neighbors (not Those Who Burn, but the other side of me) cut down every single tree in their yard last week and bulldozed it. I suppose to add sod. Idiots! Oh good grief. They do that here too. I don’t get it. Go trees! When I moved to my property eight years ago, there were 21 trees. Since then I have added 22 more. All on .16 acre. I love trees. You have your own little forest. Thanks. I’m very happy with my garden now. I especially love the way you are doing the spiral, it’s such a great use of space. I’ve always wanted a spiral path that I could walk. My old garden in the city didn’t have enough room. 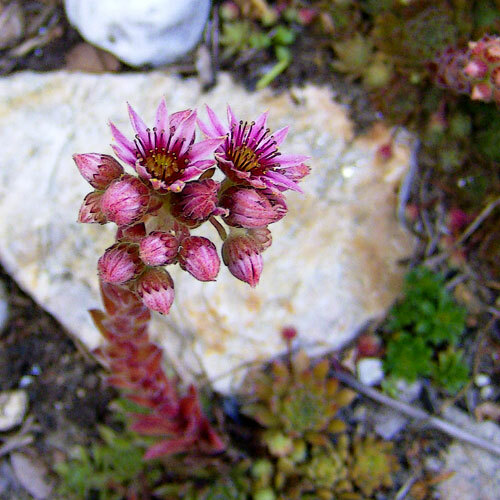 And I too have never seen blooms on hens and chicks, never knew they did in fact. When you post pictures, it brings up a memory of an old book called “The Findhorn Garden”, did you ever read it in the 70s or so? My memory isn’t so sharp, but it seems it was about a garden somewhere in Scotland or England, a small community of people lived and worked it, and it was somewhere near a rocky sea bluff a little like yours and they ended up having vegetables of amazing sizes and stuff. Findhorn! I read that book long ago. I wanted to go there when I was in Scotland but it was too far up north and I was lulled west by those enchanting cold little islands. 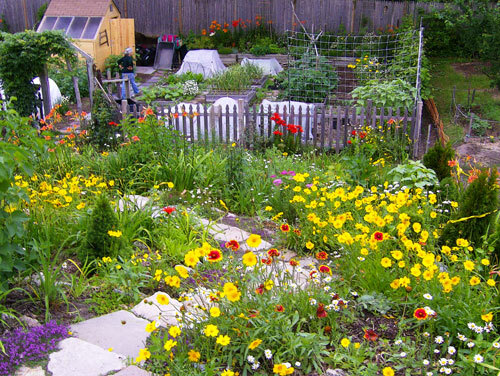 My family always had an organic garden but the Findhorn book is what first opened up for me the ideas of permaculture, creating a micro-climate, season extending, etc. I’ve been fascinated with it ever since. Yes. It does make this all quite a bit easier to have C.P. helping me. Now that makes me wonder, for creating extended gardens and micro-climates, is it best to do that living near the sea? You can do different things with different landscapes wherever they are. There are naturally occurring micro-climates and then what you can set up yourself using strategic plantings and structures. Find out the potential strengths of your landscape and push those, find out the weaknesses and compensate for them. I just kept reading books on gardening and engineering (yes engineering!) and experimenting to work things out. I think for the northern states it helps to be right on the coastline. In the Northeast, the Gulf Stream (a current of warm air and water that originates in the Gulf of Mexico) runs parallel to the coastline until it hits Cape Cod and then veers east. 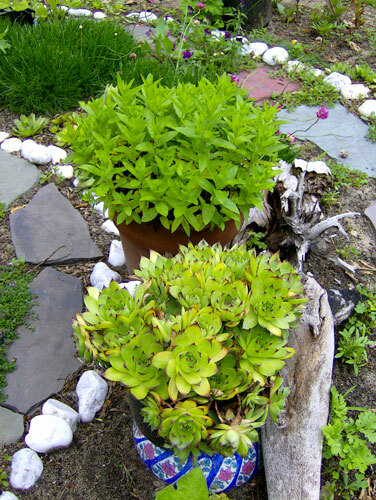 Cape Cod is considered Zone 7 for gardening, which is a climate more like the mid-Atlantic states many hundreds of miles south (ie. “sub-tropical”). We’re within Cape Cod Bay, where right on the beach it’s Zone 6b, but just a short distance to the west it starts heading down to zone 5 (cool temperate). By using various tricks, we can make our garden grow “as-if” it was Zone 7. 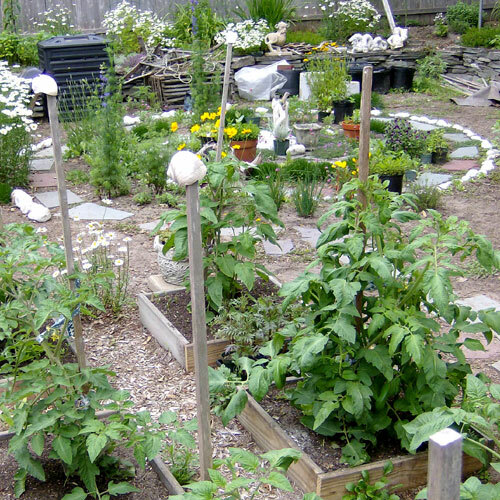 Our neighbors, who don’t use these tricks, are far behind us in garden yields. In the Northwest states, there’s a trade wind current from the pacific that brings warm air and water from the south and makes the winters much less severe for the coastal parts of Northern California all the way up to Alaska. People at the same latitudes further inland suffer much colder winters. 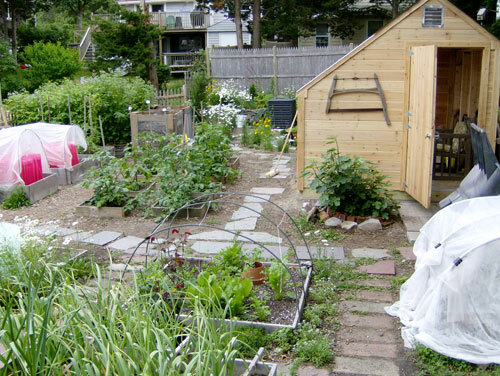 But even non-coastal people can use all kinds of adaptations to extend the growing seasons. With a combination of cold frames, greenhouses and other nifty structures, one could grow tropical plants even in Canada. Wow, that is definitely something to be proud of! I am very impressed. Your greenhouse is beautiful too. Are you at the point of being almost self-perpetuating with the garden now (as in saving seeds and starts for the next year instead of buying them)? 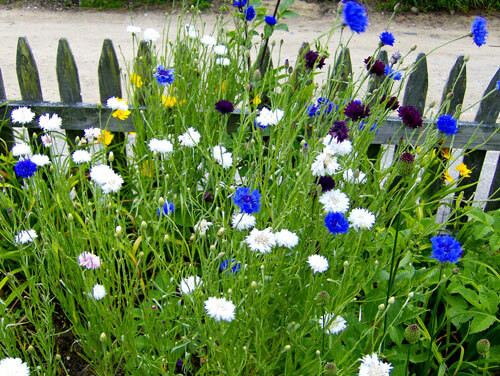 I save a lot of seeds, make cuttings and use self seeding annuals. I do still buy some seeds but I grow everything from cuttings and seeds. I very rarely buy plants. I also like to trade and to work with volunteers, anything seeded by birds or animals or the wind or my compost. I sometimes bring plants home from the Plimoth Plantation so very little need to buy them. It looks beautiful – and fun too. I envy you I have to admit! Neighbors Beware is Right On! The Brits can’t get here fast enough. I wish you were coming here now. You also need to stay for more than just a few days please. Re: Neighbors Beware is Right On! Oh, what a lovely and picturesque little world within a world! You must certainly have a good strong back and work ethic as well as a wonderful imagination and sense of harmony and beauty. Enjoy your little piece of paradise. It keeps me healthy and saves money. This weekend C.P. and I built our own deck and stairs outside of the kitchen. It’s a little breakfast nook. That was my idea of fun. You always post pictures of your garden just when I need most to see them. You’re welcome. I hope everything is okay. I am absolutely loving your garden. Everyone needs a shed like that! 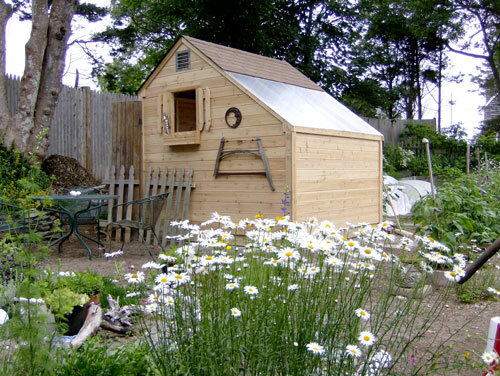 Did you build this greenhouse yourselves? It’s great! No. We’re not quite that talented yet. We are just cheap labor. We were going to build it ourselves but didn’t want it to fall over. A deck, fences, and compost bins are our biggest achievements so far. We’ll see how the matching cold frame goes. We are building that ourselves. I tend to believe you two can do anything! The picture with your Mama in it really shows just how amazingly beautiful your garden is! How much time does it take to keep your garden so wonderful and healthy, if you don’t mind me asking? It’s difficult to know how much time it takes because it’s so well established and integrated with everything else in my life. It was much more work in the beginning. Now it’s kind of all mixed up with relaxing, making art, preparing meals, etc. There are three of us (my husband and my mother) interacting with the various gardens and I’d say that we all do something out there every day. I could easily spend a few hours in the garden a day and often do just that, either in one stretch or in small increments. It doesn’t seem like work to me though. Seems like you have a great routine! I’m looking forward to a time when I understand what I’m doing and can enjoy the garden. Lately all I seem to be doing is weeding, so I’m feeling a bit of the garden blues at the moment. I underestimated how much mulch we’d near this year the weeds are happy about that. The more I get into composting the less time I spend weeding. I now use the compost as a thick mulch. Whatever weeds come up that I do not eat (purslane, dandelion greens, lambs quarters) come up out of the compost mulch easily. 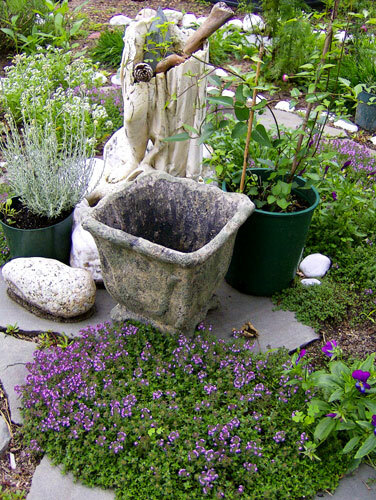 Most weeds actually prefer poor soil. You can actually tell a lot about the condition of your soil by which weeds like to come up and how well they thrive. I’ll find the chart and post it. It makes weeding a little more fun and anything that makes weeding easier or more fun is a blessing. I’d like to try composting once I get my backyard in order. I live in the foothills of the Appalachians, and our soil is all clay and rock. We’ve dug out boulders from our front yard!